The II-V progression is one of the most popular chord sequences, especially in Jazz, and jazz-influenced styles. 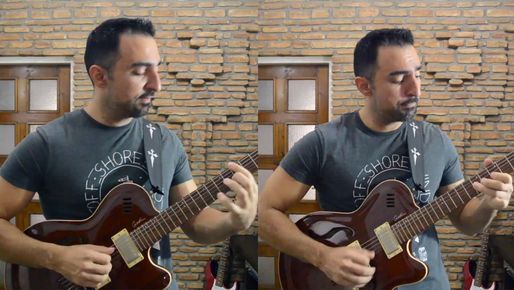 In this lesson, we look at some practical ways to improvise over II-V progressions, using Pentatonics and Blues Scales. In SFS Pentatonics 2 we study how to quickly map pentatonics and blues scales everywhere on the fretboard, in order to handle songs that have chord and key changes that require changing scales quickly. But there are cases where just using a pentatonic scale for each chord is not enough. So we learned some quick and easy, yet nice sounding, solutions for these cases, such as using the diminished or whole-tone scale. I have posted some of that in the EMP Blog as well, so you can check out those lessons as well ["Instant Whole Tone Scale", "Instant Diminished Scale", "Where to use the H/W Diminished Scale"]. In this lesson we will look at one more case, a chord progression, where using a single pentatonic scale for each chord is not always practical, and we will look at a quick and easy way to improvise through it effectively. If you don’t know what a II-V progression is, don’t worry! I will give you a quick explanation in just a bit. A II-V chord progression is extremely common in jazz, especially in traditional jazz styles. In fact, if you look at jazz standards from a real book or a fake book, many of them are constructed almost exclusively of chains of II-V’s in different keys. Many players spend countless hours practicing improvisation over this progression, and some even memorize hundreds of classic II-V licks in order to capture the essence of this style. And indeed, if you want to be a jazz master, you have to learn the language of the style, and get proficient in the melodic elements that make it up, such as 7 note scales and modes, be-bob scales, arpeggios, chromatic approach notes, and of course pentatonic scales. In this lesson we will only look at using pentatonics in a specific way that will make it easy for you to handle this progression, although of course this will definitely not make you a jazz master by itself. This is just one option. If you want to go deep into jazz, you will have to add more options for improvising over II-V’s later. But this is so simple and effective that it can work even for guitar players that do not want to invest the time to dive into jazz right now, but need to be able to make it through a jazzy jam session and contribute some nice playing and have fun. Now, before we see how this works, we need to be able to recognize a II-V progression when we see it in a song. So here is how: Whenever you see a minor (or a minor 7) chord, followed by a dominant 7 chord that is rooted a perfect 4th above, that’s a II-V progression. For example let’s say I have a Dm followed by G7. Count 4 notes up from the D and you have: D, E, F, G. G7 is a perfect fourth up from Dm, so Dm followed by G7 is a II-V.
Now I don’t want to turn this into a theory lesson so that’s all I’m going to say. If you want, you can research this more on your own. So whenever you see this kind of progression, your first reaction based on what we learned already would be to play two separate pentatonics or blues scales, in this case D minor and G major. And indeed that can sound ok. I play an example of that in the video. But in Jazz, there are cases where these chords move so quickly, that it’s not practical to switch for each one. And even if you are proficient enough to do it, this can sound a bit chunky and clumsy, especially over the V chord. Most jazz players would use different options that sound better. Well, one of these options is actually a simplification. What you do is to just ignore the V chord and stay with the pentatonic that corresponds to the II chord for the whole thing. In our example we would play D minor pentatonic and ignore the G7. This actually is a very sound harmonic choice, because the notes of the D minor happen to be "upper structure chord tones" of the G7. But as I said we don’t want to turn this into a theory lesson. The bottom line is that this works fine. In the video I play an example of this. I play Dm7, G7 and then resolve to Cmaj7. The Cmaj7 is the "I" chord and it is the most usual resolution for II-V’s in songs. So I improvise using D Minor Pentatonic /Blues Scale for the first two chords (Dm7-G7), and then C Major Pentatonic /Blues Scale for the the 3rd (Cmaj7). Now as I said, this is just one solution and of course does not capture the whole spectrum and beautiful character of jazz, but is’s easy and it works fine. This approach is actually used in other styles as well. A well known example is an old Tito Puente tune, called "Oye Como Va", that most of you probably heard played by Carlos Santana. This song has this progression going all the time, and Santana plays mostly the blues scale over it. So what you can do, is to find any of the many available free II-V backing tracks on YouTube, or elsewhere on the internet, and practice this yourself. Use the pentatonic or blues scale that corresponds to the II chord over the whole II-V, and if there’s another chord after that, use an appropriate pentatonic for that as well. “Enjoy your practice and be effective”.